The standoff between Naver and its unionized workers continues to escalate over the company’s working conditions and labor regulations, as the tech giant’s labor union has threatened to go on strike after its negotiations with the management fell apart despite some 15 attempts. Naver’s labor union has warned that it could take collective action if the management does not engage in “meaningful” dialogue. The union, launched in April last year, has said that it plans to take the first collective action on Feb. 22. While the labor union has demanded improvements in working conditions, the key impasse at present is whether to designate the maximum number of members that can take part in collective actions. The firm argues that a collective agreement must designate a certain number of laborers who cannot take part in collective actions for the sake of sound operations of the internet service. The union claims that such a demand is an attempt by the company to weaken the union by designating a majority of employees under the category. 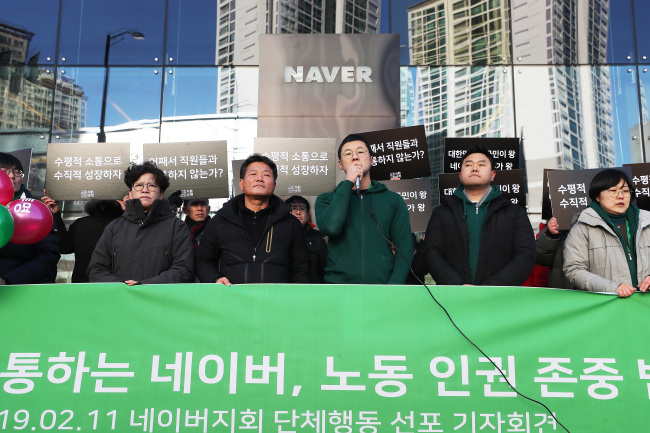 “We will have no choice but to consider taking the most powerful collective action possible if the company maintains the attitude of ignoring the primary rights of workers,” Oh Se-yoon, who heads Naver’s union, said at a press conference Monday. Since its establishment, Naver’s labor union has been complaining about what it views as poor working conditions and restrictive labor regulations at the country’s biggest internet portal company. The unionized workers have criticized the management for rejecting their demand for more holidays and break time. The union has called for 15 days of holiday in a sabbatical year and 10 days of paid paternity leave for male workers. Some employees of a Naver subsidiary -- particularly workers engaging in customer service -- claimed that they were even forced to take turns going to the bathroom because of their heavy workload. “We can’t even go to the bathroom whenever we want because we are required to respond to consumers’ requests,” said Park Kyung-sik, who leads a labor union at CommPartners, a second-tier subsidiary of Naver. Faced with mounting challenges, Naver said Monday it will engage in sincere negotiations while ensuring that the company’s internet service will be provided to customers smoothly. The union is the first of its kind since Naver was established in 1999. About 40 percent of Naver’s workers have reportedly joined the union. Nearly 4,000 workers are employed at Naver and its affiliates.